Зелений тариф на електроенергію в Україні. Each of us thinking how to save on utility bills. But not everyone knows that you can not only save money and even earn them through nature. Maybe you already know about the “feed-in-tariff” , and have not understood it. Now we find out what is “feed-in-tariff”? “Green” tariff, or as it is also called “feed-in-tariff”, a global mechanism of alternative energy. It is used in over 60 countries and all 28-EU countries,but also in Ukraine.The main purpose of this program is to increase public investment and business in renewable energy. The aim of the program is achieved through long-term contracts to purchase electricity in households or business structures that produce it on renewable energy sources. 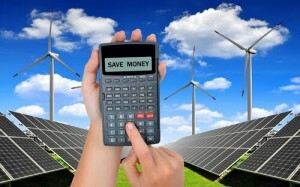 In Ukraine, the “feed-in-tariff” – a state program for the development of alternative energy. Under this program, the wholesale electricity market of Ukraine is obliged to buy from undertakings, the electricity produced by the “feed-in-tariff”. 450 MW to 2300 MW. Thus, the state Ukraine encourages the development of alternative energy and how we make money on electric energy, because it is very cheap and expensive equipment? And you’re right … but not quite. For “feed-in-tariff” by 2030, set specific prices paid for electricity generated using renewable sources. For example, today in Ukraine, the electricity tariffs ranging from 45,6 kopecks to 147,9 kopecks per kW/h, and the “feed-in-tariff” we sell electricity to the state by 454 kopecks per kW/h, it is in the case of solar energy and 284,4 kopecks per kW/h in the case of production of wind turbines. That is, at a price several times higher than the state sells to consumers. 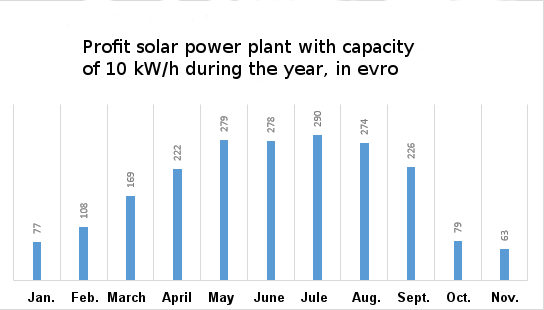 The graph you can see what makes solar power plant that receives average solar energy in Ukraine for the year. This figure may vary depending on geographic location, the specific micro-climatic conditions and the quality of planning work carried out before installing. In total for the year so solar power plant earns more than 2000 euros. For wind power, the calculations can only be conditional, because efficiency depends not only on indicators of average wind speed, but also on the location and proper installation equipment. Even if the wind speed is not high enough, properly chosen equipment, and a windmill can increase its efficiency by 200%. Therefore, before buying and installing any equipment, we recommend you use the free advice of our firm. The following table shows gains bring wind turbines and solar power for 5, 10, 15 years of use. Now we know what “feed-in-tariff” and how it will help us make the sun and wind. And how do we take advantage of this offer from the state? We consider all the subtleties of design, accounting and the calculation of “feed-in-tariff”. Matching circuit connecting generating installation in the day receipt messages and providing consumer credit to pay for services with the installation of metering unit. Regional energy company and owner signed an agreement for the sale of electricity generated from solar energy or wind energy. The second part, it records the electricity in your home. Here everything is much easier. Removing the impression metering devices regional energy companyheld monthly. Not later than the 10th day of the following month report provides the energy supplier of gas consumption, ie the volume and direction of overflows adopted-supplied electric energy. Also every 6 months regional energy companyspends in consumer checklist removal impressions count, then issued an act of acceptance and transfer of electricity (in 2 copies). And the last part, a calculation of profits from electricity production. To do this, the energy supplier calculates the difference and consumption of electricity produced and pays its positive at a rate of “feed-in-tariff” manufacturer. Paying for electricity production conducted monthly, and for late payment of electricity, power companies pay a penalty. In all the intricacies of drafting assembly works, design of “feed-in-tariff” connecting the finished installation will help you understand our experts. If you have any questions about the “feed-in-tariff”, you can contact our advisers for help.